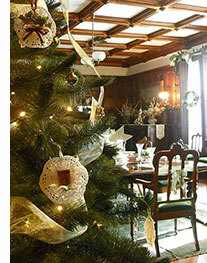 (16/115) TRENTON – A popular Christmas event that celebrates the holiday in both Victorian and modern themes will be showcased this month at Ringwood Manor and Skylands Manor, both located in Ringwood State Park in Passaic County, the New Jersey State Park Service announced. The 41st Annual Victorian Christmas at Ringwood Manor, usually held over two weekends, has been expanded to a third weekend due to its popularity. The event is a partnership of the Women’s Club of West Milford, North Jersey Highlands Historical Society and Ringwood Manor Association of the Arts. In addition, Skylands Manor will host the 28th annual Holiday Open House for individuals and groups, as well as for wine and candlelight tours. This year’s theme is “A Gardener’s Holiday.” The Open House is sponsored by the New Jersey Botanical Gardens and Skylands Association. Ringwood Manor, which is listed on the National Register of Historic Places, is a stunning 19th century house that was home to well-known ironmasters in the 19th and 20th centuries. Situated on a low hill overlooking a bucolic landscape, the house is an ideal location for visits during the holiday season and winter. Skylands Manor is a 44-room mansion built in the 1920s to mimic the English Jacobean architecture common in the English countryside 400 years ago. The mansion is located within in the 96-acre New Jersey Botanical Gardens, which is part of Ringwood State Park. The decorating theme at Skylands Manor changes annually. 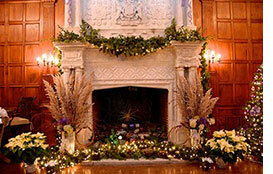 Individual rooms are decorated by volunteers from northern New Jersey garden clubs, Master Gardener programs, local companies, as well as New Jersey Botanical Gardens members.